The Fates, three women who control the magical universe, got fired. On the run, they turn to an old friend for help, but that friend died. Her niece, Vivian Kineally, runs her estate. Vivian, who loves comic books. Vivian, who also happens to be psychic. Dexter Grant, the inspiration for the greatest superhero of all time, lives a simple life. He runs a pet store in Portland, Oregon, and privately calls himself a Kitten Superhero because he saves stray animals. But he aspires to something greater. The Fates steer Vivian to Dexter. They want his help. Together, Vivian and Dexter must save the Fates—and deal with true love all at the same time. WHY DO ALL superheroes have to look like Superman?” Vivian Kinneally asked as she studied the interior of her nephew’s comic book. She was sitting on the stoop outside her apartment building, her eleven-year-old nephew Kyle beside her. The sun cast its warm rays on the concrete steps and illuminated Kyle’s latest hand-drawn effort. In the week that Vivian had lived in Portland, the sun had been out every day. She had no idea how the city had gotten its rainy, gloomy reputation. “He doesn’t look like Superman,” Kyle said, craning his neck over the double-page spread that rested on Vivian’s knees. She loved that dimple. She had always thought—and never admitted aloud—that the Siegel and Shuster Superman, the original, was the handsomest man she had ever seen. Even if he was only a creation of paper and pen. “Superman doesn’t have a dimple,” Kyle said. Kyle wrapped his arms around his waist and leaned forward, extending his Nike-covered feet down three steps. Vivian’s brother, Travers, kept Kyle dressed like the athlete he would never be. Vivian wondered how Kyle would do now that she had relocated here. “Michael Keaton in Batman,” Kyle said before she could. She’d made that argument before. “You said you wanted to know what I thought,” she said. Vivian smiled at him. Kyle’s greatest dream was to become a comic book writer. Travers said that was her fault. Vivian had the most extensive comic book collection of anyone she knew—and she knew a lot of comic book fans (although most of them weren’t twenty-seven year-old women). When she was a kid, comic books had been her escape. In them, she found people with secret identities and super powers, mutants who decided to fight on the side of all that was good and right. She had a super power too, although she had never thought of it as that, at least not when she was growing up. Then it had simply been something else that marked her as different. She hated being different so much. She was teased by her peers. She used to look at the superheroes and daydream that someday she would meet one, and he would sweep her off her feet. She could even imagine the panel art: an entire page with Superman or Batman or some other square-jawed (and dimple-chinned) superhero with a cape, carrying her in his arms. Vivian slid her own round glasses up her nose and stared at Kyle’s art. He was spectacular for someone his age. There was a confidence to his work that most young artists lacked. His stories were still derivative, but she knew that originality took time—and Kyle had plenty of time. She raised her head, seeing if she got a sense of her brother Travers. She was psychic, and there were some people she was particularly attuned to. Her brother Travers was one of them. So was her younger sister Megan. And, until a few weeks ago, Vivian had been attuned to her Aunt Eugenia too. “You okay, Aunt Viv?” Kyle asked. The family question. Everyone was always worried whether Vivian was all right. It had started before she could even remember. She would say things or get a funny look, and everyone would panic. Then, at thirteen, she’d started to black out, and her parents had taken her to specialist after specialist to see if there was some physical cause. Then her Aunt Eugenia had come to visit. Mysterious, wealthy Aunt Eugenia, whose age no one knew and whose exact relationship to Vivian’s mother was unclear as well. Vivian’s grandmother once said that Eugenia wasn’t a blood relation at all, but a close, close friend who had wormed her way into the family’s hearts through deeds of goodness. With family members who talked like that, was it any wonder that Vivian had fallen in love with comic books? “Aunt Vivian?” Kyle was peering at her, his face owlish in the bright light. “I’m all right,” she said, the words so familiar she didn’t have to think about them. Aunt Eugenia had told the family that Vivian’s blackouts were normal, that her power was growing stronger. Vivian’s mother had gotten upset over the use of the word power until Aunt Eugenia made Vivian’s mother admit what she had always feared about her daughter—that Vivian had an amazing psychic talent, a talent that seemed to be growing worse (or better, depending on one’s perspective). The blackouts faded once Vivian hit high school, but by then, she was the weird kid. She wore glasses, she had been too skinny, and she had passed out all through middle school. Sometimes she blurted out things that other kids had only been thinking, and eventually they all stayed away from her. Vivian put her arm around Kyle. He was going to face that horrible world in a few years. There was nothing worse than middle school, especially for a sensitive kid. “Dad’s coming, isn’t he?” Kyle asked, looking down the street. This was a side street downtown, with a great view of the mountains, rivers, and bridges, and the added benefit of very little traffic. “I don’t sense him yet,” Vivian said. Travers had taken the car into the local Jiffy Lube to make certain it was ready for the long drive home. When he returned, he expected Kyle to be ready to leave. Travers wanted to stay with Vivian—and Kyle had argued for it—but they had other obligations. School was starting next week, and Travers had enrolled Kyle in some expensive gifted and talented program that no one had even imagined yet in Oregon. Kyle was heading home, and Vivian didn’t argue with the decision. She had a sense, just a sense—and she wasn’t even sure if it was accurate because her senses about herself often were not—that staying in Portland would be dangerous. “You’re going to mail me your next comic, right?” Vivian asked. Kyle’s gaze returned to hers. His eyes were a pale blue, like his father’s. He would be reedy and handsome someday, just like his father. The relationship showed. Of course Kyle’s relationship to Vivian didn’t show. Vivian, like her brother and sister, had been adopted. All three looked very different. Vivian was small, skinny, and dark. Travers was tall, slender, and blond, and Megan was a green-eyed redhead who, at twenty-five, still hadn’t lost her baby fat. It was an old tease and an accurate one. It had taken Vivian years to get a computer. She had refused to buy a VCR, and now VCRs were almost obsolete. When she moved here, Travers had given her a DVD player as a housewarming gift, and Kyle had made certain she knew how to use it before they left. They were both afraid she’d be lonely. They were right. She’d never lived so far from her family before. But it wasn’t just her family she would miss. She had no friends here. All her friends in L.A. thought she was moving for a man. But there was no man either. There never had been. Then, for no particular reason, she thought of Travers, his hands on the steering wheel of his SUV, the radio playing Clint Black’s “No Time to Kill.” Travers was thinking about the words, worrying about Vivian, and trying to figure out a way to get her to come back to L.A.
“He’s almost here,” Vivian said to Kyle. “Aunt Eugenia wasn’t an old lady,” Vivian said. At least, she never seemed like an old lady, although she had to be at least eighty. She had looked the same all of Vivian’s life—and, apparently, all of Vivian’s mother’s life as well. One of Vivian’s many tasks would be to track down a birth certificate—if that was possible. Aunt Eugenia’s mansion had burned down the morning after the police found her body. Travers had turned onto Burnside, which wasn’t very far away. He had the radio blaring in his SUV, and now the station was playing Alan Jackson. Vivian wanted to put her hands over her ears, but knew that wouldn’t solve the problem. Somehow Travers’ environment was leaking into her own. “Scared?” She turned toward him. She was scared, but not of dying. Of living in a strange town for several months. Of testing new skills with her psychic powers. And trying to figure out all the clues Aunt Eugenia had sent her the week before she died. Oh, and visiting the attorney who had contacted her about Aunt Eugenia’s will—the one that dated from the day Vivian was adopted. Apparently, Eugenia had left her entire estate—worth several million dollars—to Vivian. Vivian couldn’t believe that Eugenia hadn’t updated the will after Travers’ and Megan’s adoptions. There had to be another version somewhere. She just had to find it. But as she asked the question, Travers’ SUV turned onto her street and sped past the parked cars in front of the other apartment buildings. He drove twice as fast as anyone in Oregon, and Vivian was afraid he’d get pulled over. Oregon cops wouldn’t be lenient on Travers. He had California plates and a California driver’s license. She’d learned, in her short week in Portland, that the only people Oregonians consistently discriminated against were Californians. “That’s Dad!” Kyle said, standing and waving as if Travers had forgotten where Vivian lived during the hour he’d been gone. The moment passed. Vivian clutched the comic book, careful not to crease its pages, and followed her nephew down the stairs. Travers stopped right in front of the building. The booming bass from his SUV’s speakers blended with the sounds in her mind. When he shut off the ignition, Vivian heaved a sigh of relief. Although she doubted it. Eugenia’s estate was a mess. The fire created even more problems, and the murder—well, there were things about the murder that Vivian hadn’t told anyone. Things she had seen, things she had felt, while Aunt Eugenia had been dying. In spite of herself, Vivian shivered. Vivian peered at him. Her glasses had slid down her nose again and she saw a dual image of him—the young eleven-year-old, crisply outlined against the backdrop of his father’s black SUV, and a fuzzy, larger version, the man Kyle might become. Vivian shoved her glasses back into place, pushing so hard she poked a fingernail into the soft skin on the bridge of her nose. “Yeah, but I’m not able to see the future. Just the present.” And sometimes that was more than enough. “I thought psychics see the future,” he whispered. “I don’t think it does,” Kyle said, and for the first time in Vivian’s recollection, he sounded a lot older than eleven. She looked at him, feeling an odd sensation, as if she were missing something. But he was already running down the sidewalk to greet his father, as if they’d been separated for years instead of hours. Vivian followed, sighing. For the first time, she realized just how difficult life was going to be here. She wouldn’t have Travers’ common sense to rely on, or Kyle’s jokes to give her joy. But she didn’t want them facing the same thing Aunt Eugenia had faced. Vivian could take care of herself, but she couldn’t handle it if something happened to her family. Her sixth sense had been working overtime—and she knew Kyle and Travers were leaving none too soon. DEXTER GRANT LOOKED inside the filthy box sitting on top of his pristine countertop. Five mewling kittens nosed the crumpled newspaper as if it held the secrets of the universe. They were tiny, five weeks old at best. They hadn’t lost their downy fur yet and their eyes were barely open. “I don’t take animals,” he said to the woman who stood across the counter from him. She was meticulously dressed, wearing a silk suit that shone in the light from the hundred working aquariums that lined the walls. “You’re a pet store, aren’t you?” she snapped. He nearly corrected her—he wasn’t the pet store; he owned the pet store—but he knew that it would gain him nothing. And he already had a heck of a battle on his hands, one that was becoming all too familiar these days. “She’s dead,” the woman said flatly. Her son, who had been eyeing the exotic fish in the saltwater tanks, started. The boy had been Dex’s clue that something was wrong here from the start. Even though the woman was painstakingly put together, the boy was a mess—his hair uncombed, his skin dirty, and his shirt ripped. He was old enough to take care of himself—maybe thirteen at most—and old enough to rebel against an obsessed parent. “How’d she die?” Dex asked. Nursing mother cats rarely left their broods. It was unusual for one to die when she had kittens this young. “Squashed,” the woman said, moving her hand in dismissal. Bracelets jangled as she did. The boy was watching closely now, as if he couldn’t believe what he was hearing. “And the kittens were unharmed?” Dex asked. “Pay you?” Dex choked. That part was new. “They’re stock, and you’re a store. You should pay your suppliers,” the woman said. “So wean them,” the woman said. As if he could snap his fingers and wean the kittens. Then he shook his head. He could do that—he had all sorts of magic powers—but he wouldn’t. The less he tampered with the natural order of things, the better. Still, this had already gone farther than he liked. He couldn’t very well give the kittens back to this woman. She would take them to every pet store in Portland, and when she discovered that stores didn’t pay for strays, she’d probably dump them beside the road. He truly despised people like her, but he couldn’t do much about her—at least through regular legal means. And the things he wanted to do would get him in trouble with the Fates. He’d spent the last few decades watching his back so that the Fates had nothing to hold against him. There were a few other things he could do, things on the borderline between legal and not, things that would at least prevent her from coming into contact with vulnerable creatures again. Harold. Poor kid. Dex had known quite a few Harolds in his hundred years, but most had been born at the turn of the twentieth century. Kids who would make it in the twenty-first would see the name Harold as something to overcome. The woman headed to the door. The kid followed, as if he were a prisoner being led by an invisible chain. “I’m sorry,” the kid whispered as he passed Dex. And that was what decided him. Dex did snap his fingers—that was one of the many ways he could do magic—freezing time around him, along with the woman, the boy, the fish, and the poor, mewling kittens. The woman’s manicured fingers just brushed the door handle and the kid was in front of the counter, the embarrassed and worried look still on his acne-covered face. The kittens appeared even younger than they had a moment before. Dex revised their ages downward another week. Their eyes had probably just opened. It was up to him. Look at what he’d become. Dexter Grant: Kitten Superhero. It wasn’t a title he minded, although it did lack the glamour of his past. Still, he stepped into the role. With a delicate movement of his fingers, he opened a rip in reality, searching for the kittens’ mother. He found her in the woods outside an expensive house on Portland’s west side, plaintively meowing for her missing children. How did he know that was what he was going to find? This cruel woman had taken the kittens away from their mother, seeing dollar signs. The cat didn’t even have a collar, and her coat was rough. She was probably a stray who’d ventured into the wrong yard. Then Dex glanced at the boy. Or maybe she had become a companion to a lonely child. He sighed. Maybe he wasn’t just a kitten superhero. Maybe he still had some weaknesses for human beings. Now he had to do more spells, just because this horrible woman had walked into his store. He did the spells in rapid succession. First, he clapped his hands together, bringing the mother cat to her babies. She landed inside the box—and he had to do an emergency spell before she thought her frozen offspring were dead. The kittens started mewling, and the mother cat heaved a sigh of relief. She didn’t even look confused about her sudden change of venue. She just seemed happy that she had found her brood. She lay down and the kittens nuzzled at her teats. Dex smiled, relieved that this one would turn out all right. Then he spelled the boy, adding a memory. The boy would think he had managed to defy his mother and had brought the mother cat in on his own. Then Dex did one last spell. He put a hex on the woman herself, making her seem poisonous to any domesticated animal that came to her for help. That, at least, would prevent this from happening again. The kid wouldn’t be able to have pets while he was growing up, but given the mother’s insensitivity, that would probably be a good thing. No sense in teaching Harold how to mistreat animals. With his subtle rebellious nature and his tender heart, he might grow up to be one of those people who adopted animals instead of harming them, so long as he didn’t have his mother’s cold-hearted example. The mother cat was purring. She looked up at him with warm, adoring eyes. “We’ll take care of you,” Dex said, wishing it would be as easy as those last few spells had been. He’d have to dig into his meager coffers to fix the cat and vaccinate her, and he’d have to do the same with the kittens. Then he’d have to figure out how to give them away. He already had way too many animals at his house. He didn’t want to sell the kittens at the store, but he might have no choice. He’d have to use more magic in that case. He wasn’t about to let a kitten go home with someone he didn’t know. Dex snapped his fingers and the “freeze” spell ended. The woman continued her way out the door. But Dex touched the kid’s arm as he passed. “You did the right thing, bringing the mother and her kittens here,” Dex said. And you couldn’t make a profit at the shelter. “You know her attitude about animals is wrong,” Dex said, treading lightly. No matter how awful a parent, a child often refused to see it. “How come you don’t have pets in a pet store?” Harold blurted out, as if he’d been bottling in the question. Harold nodded. His fingers dipped into the box and lightly touched the mother cat’s back. She closed her eyes and continued purring. Dex shouldn’t have worried about Harold; the cat was letting him know the boy was all right. “I always wanted a cat,” Harold said. Her tone made Dex jump. “Coming, Mom,” Harold said. Then he whispered, “Thanks,” as he hurried out the door. Dex watched the boy and his mother through the shop window. They crossed the parking lot, the mother berating the boy. Dex had the magic to spell that relationship too, maybe even fix it, but such intervention in mortal lives wasn’t allowed. The Fates had already given him a warning, telling him that he was violating the rules made centuries before he was born. He wouldn’t get another warning. They would zap him away from whatever he was doing—even if he were saving a life—and then they’d try him, and probably send him away for a millennium. If he’d been a slightly different man, he would have continued intervening—after all, what was the point of magic powers if you couldn’t use them for all that was good and right?—but he couldn’t stand the thought of the Fates’ punishment. He’d heard about some of the sentences the Fates had dealt out, like forcing master musician Apollo to listen to Wagner’s Ring Cycle for three hundred years, which would have been bad enough even if the singers hadn’t been nearly a half step flat. The last thing Dex wanted to do was be sent to some Fate-imagined hell, probably (for him) a place without any animals at all, just because he had done something he believed to be right. So he’d had to rely on his own instincts, pushing where he could push and being subtle everywhere else. He’d done both here. If he had to defend his spells to the Fates, he’d tell them the truth—he’d hexed the mother so that no other animals would cross her path. And he’d tell the Fates the only reason he’d spelled the boy was to make certain the kid wouldn’t notice anything wrong when Dex had to bring the mother cat to her kittens. All the things he had to do to pretend he wasn’t using his magic. He resented it. And he missed the days when he saw trouble and responded, using the gift he’d been given. Dex leaned over the box of kittens just like Harold had. The kittens were still nursing, and the mother cat was still purring. Everything looked fine, but Dex had a lot of work to do if he was going to care for these cats—and he would be the one to care for them. The local shelter was overstocked with strays and kittens, and he didn’t want to throw more into the mix. Someday he wished he could find someone else who cared as much about animals as he did. Someone who wasn’t a vet or a pet store owner, someone who had a warm heart and a good soul. He smiled at himself. In a hundred years, he hadn’t met a woman who interested him. Even though his personal prophesy from the Fates said he would have a great love, he didn’t believe it. No woman had ever interested him beyond a passing fancy. He was beginning to think he’d never meet the right one. He picked up the phone and dialed his vet’s number from memory. As the ringing sounded in his ear, he swiveled toward the cash register. He started punching in the prices for a cat bed, a litter box, and some Science Diet cat food. He was becoming his own best customer. “Heart’s too soft, Grant,” he muttered to himself as the vet’s tech put him on hold. But he’d always known that was his problem. He also knew that he really wasn’t interested in a solution. Her name was not Erika O’Connell, but that was the name she had been using for the past twenty years. Her time with that name was almost up. When you were in the public eye as long as she had been, people tended to notice when you didn’t age. She figured she had another ten years before she had to fake a spectacular death or disappear on a trip to a remote outpost. Unfortunately, there weren’t that many remote outposts left, not like it had been when she was a child—four thousand years ago—when everything, it seemed, was remote. Erika O’Connell—whose real name, Eris, was not something she had shared with anyone—sat behind the desk in her Los Angeles office. She had her shoes off. They lay on the tasteful white carpet, the heel of one inside the other. Hard-copy files rested on all the leather furniture—only a custom-built wooden desk chair had escaped the clutter. Even her plants were messy, because she preferred them that way—overgrown, trailing down the sides of tables and onto the floor. She was talking on her cell phone, listening to a meeting on speakerphone, watching CNN, KAHS, FOX News, and CNBC on the double split-screen television that sat on one corner of her desk. In the center of her desk, her state-of-the-art IBM with more bells, whistles, and other unnecessary items, remained on AOL, pinging whenever she received e-mail. In one corner of that screen, stock quotes ran in real time, and in the other corner, ESPN shared the tiny television monitor with C-SPAN. And on the far corner of her desk, her handy-dandy laptop was synchronizing that day’s schedule with her Palm. Who needed magic in the twenty-first century? Technology did everything for her. The intercom on her desk buzzed, and she tapped it lightly. “In a meeting,” she said to the secretary, whose name she had never bothered to learn. Eris rarely used the Los Angeles office—she preferred the New York headquarters because no one could predict what was going to happen on any day in the Big Apple—and she viewed being here as a great inconvenience. But she had had to meet some stockholders the night before, and once in a while she had to come to them. Besides, her A-team was here, covering yet another entertainment scandal, and she was looking for a way to pry them loose. Her network, KAHS, had risen to the top tier of the cable news shows in two short years, but she still had a long way to go to become number one. She didn’t want to do it by imitating this week’s rival. Instead, she had to establish her own voice. And doing that required more than covering the latest Hollywood divorce. She wanted to cover stories that would change the world—not all at once, but one little layer at a time. She had just hung up from the conference call when her son—who was, dangerously, calling himself Stri these days—appeared before her. At three-thousand-eight-hundred and something, he wasn’t even close to young, but he liked to pretend at it. This time, he had a shaved head, a jacket that was more chain than fabric, and more tattoos than she had ever seen on a human being. “Busy,” she said as she was about to dial another conference call. He grinned. He had blacked out or discarded half of his teeth. It didn’t look menacing. In fact, it made him look like a peasant during the Russian Revolution—even with the ridiculous clothes. Or maybe she only thought that because she could remember the Russian Revolution. “Well?” she asked, when he didn’t answer. Her door opened and the nameless secretary—a mouse of a mortal, brown skin, brown hair, brown clothes (weren’t people in Los Angeles supposed to be prettier than average? What went wrong here? )—crept into the room to throw more paper on one of the chairs. “I’m having a meeting,” Eris snapped, furious that her son hadn’t come in by normal channels. “Yes, ma’am.” And the secretary backed out. Stri didn’t even turn around, nor did he wait for the door to close to start telling his news. He always created trouble. That was one of the things Eris loved about him—most of the time. “The kids have taken the oath and are now exploring their new office,” he said. She raised a single eyebrow at him, giving him the stare she had used when she was a twenty-two-year-old mother with no magical powers at all. He cringed. Of all the tricks in her bag, that one was the most effective—at least with Stri. “Guess you’re going for finesse,” he said. “Have I ever done anything else?” she asked, and he looked away. Last time he did, he ate some of the food and lost a hundred years before Eris even noticed he was missing. “Just trace the Fates,” she said. “I’m not someone who should be ignored.” He crossed his arms, and the tattoos bulged. “Busy,” she said, just like she had when he came in. “If the Fates are really gone, that won’t matter,” he said. Stri frowned, his pout looking perfectly natural on his tattooed and pierced face. He waited just long enough for her to catch the full impact of the look and then he vanished, leaving a cloud of red smoke that smelled of cherry bombs. With a wave of a hand, Eris made the smoke disappear. She wished she could make everything else that bothered her disappear as quickly, but that would be obvious, and she hated nothing more than the obvious. She smiled. Everything was going well. She was even ahead of schedule. With the Fates gone, her life would get a whole lot easier. She might even abandon some of her finesse and reveal a tiny corner of herself. The last time she had done that, the world had taken notice. It would take notice again. VIVIAN WAS DREAMING of a world filled with homeless kittens, kittens that people kept dumping on her doorstep, expecting her to take care of them. They were little and they seemed to be multiplying asexually. Every time she touched one, there would suddenly be two, but she couldn’t stop herself from picking them up. Then the kittens started pounding in unison, as if they all wanted to join the cast of Stomp, and she kept telling them to stop, but they wouldn’t. It took her a few minutes to realize that the pounding really existed. She sat up and rubbed a hand over her face before glancing at the fancy CD alarm clock that Travers insisted she buy. 6:45 a.m. Light was coming in through the sides of the linen shade, but the bedroom was still dark. Her heart was pounding and her eyes were made of glue. She hadn’t had much sleep. She’d stayed up, reading and rereading Kyle’s comic book, missing her family already. It felt like if she was in a hotel. She’d only been living here for a week and everything was unfamiliar. Even though it was her nightstand against her bed, her blue sheets and pillow cases surrounding her, her specially built comic book shelves holding all the boxes of her collections, the arrangement was different than the one she’d had in L.A. And she wasn’t used to the sounds of the building yet. Somehow she hadn’t thought the walls were this thin. The pounding continued. She flopped back on the mattress and pulled a pillow over her face, wishing her neighbor would answer the damn door. Who pounded at someone’s door this early in the morning anyway? The voice sounded panicked. In fact, it sounded so panicked that it kept changing tone. Soprano, alto, mezzo-soprano. How weird was that? Then Vivian pulled the pillow off her face. No one knew her here. No one except her landlord, and she had gotten the impression he hadn’t paid much attention to her application, only to her check. She hadn’t gone to the police yet to see their file on Eugenia, and she hadn’t gone to the lawyer. Vivian was waiting until Travers left, which had taken five days longer than he had promised. That mezzo-soprano/alto /soprano voice wasn’t his. And that was the only thing she could be sure of. She got out of bed, grabbed her robe, and shoved her feet into her bunny slippers. She opened the bedroom door and stepped into the combination living room/dining area. The floor-to-ceiling windows sent a cold draft across the hardwood floor. Sunlight poured in, making her glass-topped dining room table sparkle. Vivian braced one hand on a chair as she made her way to the door. The pounding grew louder the closer she got. Maybe this was some kind of scam to get someone to open her door in the middle of the night. Or the earliest part of the morning, as the case may be. Vivian peered through the peephole. Three women were crowded on the landing. Three gorgeous women, all the same height, with movie-star good looks. “Please!” cried the blonde closest to the door. The other two were looking over their shoulders down the stairs as if they were afraid of something outside. Vivian made sure the chain was on, then pulled the door open until the chain caught. “Do I know you?” she asked, peering into the hallway. The women looked in her direction. They had bright eyes and matching expressions—sort of a combination between exasperation and panic. “I don’t remember meeting you,” Viv said. “Please!” The brunette sounded terrified. Vivian was a sucker for terror. When she was a kid, she used to pretend that she would rescue people who were terrified and save them with her psychic powers. “No, it’s not,” the redhead said. “Please!” the brunette said again, in that exact same terrified tone. Vivian gave up. If they were going to mug her, they were going to mug her. Their frightened act was convincing. She closed the door to unlatch the chain—and heard squeals of dismay from the hallway. Then she undid the chain and pulled the door open again. She was nearly bowled over as the three women ran inside. “Oh, thank you!” the blonde said. “You’d better spell the door,” said the redhead. “Or maybe the entire building,” the brunette said. Vivian frowned. She was probably still dreaming. That was the only explanation. But her feet were cold despite the bunny slippers, and she had that woozy feeling she usually got when she woke up badly. To her recollection, she’d never had that feeling in a dream before. All three women gaped at her. 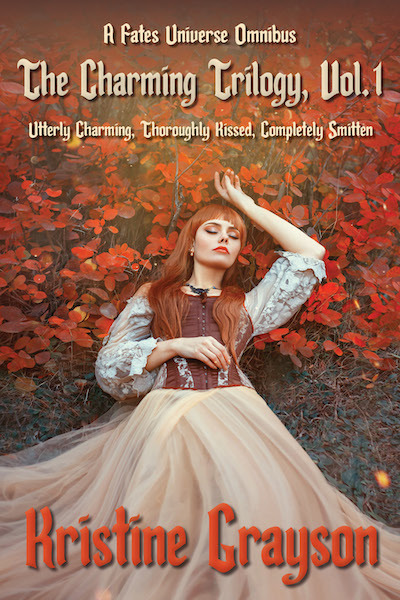 Even though they looked very different—the blonde was blue-eyed and delicate; the redhead green-eyed and zaftig; the brunette brown-eyed and model-thin—they had the same expression on their faces. “What do you mean, who are we?” the blonde asked. “You know who we are,” the redhead said. “Oh, no,” the brunette said. “Are you telling me that Eugenia told you nothing?” the blonde asked. The women were very close to the door, huddled against it in fact, and it took Vivian a moment to realize that she was preventing them from moving deeper into the apartment. Downstairs something banged. She hoped it was only a door. “I’m Atropos,” the brunette said. “And I’m Clotho,” the blonde said. “And I’m Lachesis,” said the redhead. Then they all stared at her as if she should recognize their admittedly odd names. “We’re the Fates!” they said in unison, and that was when she knew she was dreaming. Kyle’s comic book was coming back to haunt her. Either that, or Aunt Eugenia had been involved in something even stranger than usual. “Are you a rock group?” Vivian asked, deciding to play into the dream rather than fight it. “Annette Funicello?” Lachesis asked, and then shuddered. “We’re not that shallow,” Atropos said. “And then the Norse,” said Lachesis. “The Weird Sisters,” they said in unison. “As if we’re sisters at all,” said Clotho. Vivian’s head was spinning. She was beginning to suspect something was seriously wrong here—she was awake and this still wasn’t making sense. “No sane woman would wear those clothes,” said Atropos. The women stared at her as if she’d made an improper request. Another door banged downstairs—or was that a car backfiring outside? Vivian couldn’t tell. “I think the last time we spoke one at a time,” Atropos said. “Completing an entire thought on our own,” said Clotho. “Had to be three thousand years ago,” said Lachesis. They all looked confused. Or crazy. Or maybe Vivian was the crazy one. “Can you spell the building first?” Clotho asked. The women stared at each other, looking even more confused. She marched across her floor and headed into the kitchen, pushing open the swinging door. The kitchen had been remodeled just before she moved in, and still had that new plastic smell appliances sometimes had. Her large blue teakettle, shaped like the Tick with his little antennae serving as a handle, looked out of place on the black stove. She grabbed the kettle, turned on the cold water, and shoved the kettle beneath it. Breakfast. She needed breakfast. And time to think. These women had mentioned Aunt Eugenia. So they were connected to Vivian somehow, and they thought Aunt Eugenia had told her something. Maybe Aunt Eugenia had. She had sent Vivian a box full of papers the week before she died. Vivian had scanned them to look for a new version of the will and had found nothing except hand-written notes, books, and newspaper clippings from the previous century. She planned to go through it all when she had more time. Cold water splashed on her hand. She shut off the faucet, dried off the teakettle, and set it on the stove. Then she slid out her toaster and put an English muffin inside. The women would be able to smell the food. Vivian sighed. She hated being impolite, even to strangers—and was there a better word for these women? Strange—ers?—so she supposed to ease her own mind, she’d have to offer them something. Vivian pushed open the swinging door and held it in place. The strange women were still standing in her entry, huddled together and talking quietly. “Food!” Lachesis said with relief. The toaster popped. She went back into the kitchen and slathered peanut butter on her English muffin. She didn’t care what the women wanted. Her remark was greeted with silence. She poured orange juice into a MacDonald’s promotional glass from the third Batman movie, and carried it through the swinging door to the glass-topped table. The three women had gathered around her table in anticipation of food, and now that she had refused to give them what they wanted, they stared at her. Vivian set her glass down as if nothing were wrong. But something was wrong, and she just realized what it was. She had no sense of these women. She always had a sense of people—whether they were good or bad, whether they meant to harm her or not, whether they were self-involved or saintly. That was why she’d had no idea they were at her door—why she had assumed they were at someone else’s. And that was what bothered her the most about them. It wasn’t their odd way of talking or their appearance. It was that they made no impact on her psyche. As if they weren’t there at all. She almost touched one, then realized that would be a mistake. They were here, and present. They had moved her chairs, and they brought with them the faint scent of summer sunshine, not to mention all the noise. There had been only one other person in the whole world Vivian could never sense, and that had been Aunt Eugenia. Aunt Eugenia, whom these women claimed to know. “You really have no idea who we are, do you?” Lachesis asked quietly. The teakettle whistled. Vivian sighed. She did have some chocolate truffles that Kyle bought her the day before, and she hadn’t been planning on eating them. They looked too rich for her. She went back into the kitchen, took the teakettle off the burner, and shut it off. Then she made some Earl Gray, put the teapot, her muffin, the truffles, and some X-Men mugs on a tray, and carried the whole thing back to the dining room. “Well, for one thing, your police can’t help,” Clotho said. “They lack the power.” Atropos reached for a truffle. “Thank you.” The three women said in unison, and it was as if she had given them the world. They each took a truffle, bit into it at the same time, and got the identical expression of joy on their faces. “What did Eugenia tell you about the magical world?” Lachesis asked. “And to tolerate what happened to me, saying that it was pretty normal for someone with my abilities,” Vivian said. “And that Eugenia had been psychic when she was a kid, so she understood what was going on.” Vivian frowned. Eugenia had said had been, as if being psychic was something someone outgrew. She never exhibited any psychic powers around Vivian that she could remember, but maybe Eugenia had had different talents. Maybe she could foresee the future. Maybe that was why she had sent Vivian that box the week before her death. Maybe that was what Eugenia had meant when she used to invite Vivian to Portland, claiming they were running out of time. I’m not young any more, Eugenia would say during their phone calls. Nonsense, Vivian used to say, you’re going to live forever, Aunt. “We know everything about you, child,” Atropos said, and Vivian started. She never had anyone her own age call her child before. “Or we used to,” Clotho said. “And we will again,” Lachesis said, her voice rising the way people’s voices did when they were trying to cheer other people up. “How old are you?” Atropos asked. “I thought you knew everything about me,” Vivian said. “She did tell you that she was your mentor, right?” Atropos said. “No, for your magical training,” Clotho said. “Your training, you know, how to control your powers,” Lachesis said. “My what?” Vivian asked again. “Your powers, you know, the ones you’ll come into after menopause,” Atropos said. “Your magical powers,” Clotho said. “I can’t believe Eugenia didn’t tell you,” Lachesis said. “She’s always so responsible,” Atropos said. “She could have told us about losing the house,” Lachesis said. She addressed that last to Vivian. Vivian, who felt like she was only getting half of this conversation anyway, set her English muffin down. “She what?” All three women spoke in unison. “We would have known,” said Lachesis at the same time. “We should have known,” said Atropos a second later. The three women didn’t respond to that. Instead they looked at each other, and for the first time, Vivian got a sense of them. The sense was fleeting and odd, as if they were communicating with each other telepathically. They were frightened. That much she could tell, even without her gifts. A car alarm went off in the street. All three women jumped. So did Vivian, but she pretended that she hadn’t. To cover her own nervousness, she poured tea into all four mugs. “You were going to explain things to me,” Vivian said, her hand shaking. She set the teapot down. She was more on edge than she had thought. “Explain why you weren’t studying with Eugenia,” Atropos said. “I didn’t know I was supposed to,” Vivian said. “Surely she invited you up here,” Clotho said. “You thought that was more important than your training?” Atropos asked. Vivian felt her cheeks flush. If she had known Eugenia was going to die so soon, she would have made a point of coming here. But she hadn’t known. That wasn’t how her gifts manifested. “I think I did some good with that hotline.” Vivian’s voice sounded small. It had seemed like a good idea at the time—a psychic hotline with real psychics, not people who traced your phone number or used your credit reports (gleaned from your credit card number) to give them their “special” knowledge. And it had worked. Her hotline got to be known as the hotline to call. But she had to shut it down. There weren’t that many real psychics walking around Los Angeles, and most of the real ones didn’t want anything to do with her little idea. Eventually, there were too many calls for her to handle. Even though she was minting money, she had to close the doors—and then she slept for what seemed like two months straight. That was just before Eugenia died. “You would have done more good if you had had training,” Lachesis said. “Training in what?” Vivian asked again. “But Aunt Eugenia wasn’t a magician,” Vivian said. “A mage,” Vivian said, trying to wrap her mind around the difference between mage and magician, besides the spelling and the number of syllables. Another car alarm went off, and then another. The three women clutched each other’s hands. “He’s getting close,” Lachesis said. “This was a stupid idea,” Atropos said. “We agreed on it,” Clotho said. “We were forced into it,” Lachesis said. Vivian glanced out the window. Three cars in front of the building across the street were blaring, their headlights blinking on and off. She had no idea what could have set them off. “Blackstone? The magician?” Vivian asked. “Yes!” they said in pleased unison. “Do you know him?” Atropos asked. “I know of him,” Vivian said, wondering how she could know a man who had been dead for a very long time. “What?” Vivian asked. That spinning feeling had returned. The women smiled at her as if she’d won a prize. A dog started barking nearby, big deep, scary barks. The car alarms were still going, and Vivian thought she heard another one flare up. “All right.” Lachesis took a deep breath, and the others followed suit. They leaned toward Vivian in one swift movement. Another bang sounded below, and all three women jumped. “There are mortals, and then there are the magical,” Atropos said, looking toward the door. “You are one of the magical,” Clotho said. “If there is a later,” Clotho said, and she too looked toward the door. Vivian heard more banging, and then the sound of firecrackers. “He’s found us,” Atropos said. Somehow that question seemed logical—at least coming from these women. The banging stopped, but the sound of firecrackers continued. It faded and blended into the sound of sparklers. Then smoke came in under Vivian’s door. The smoke filtered across the floor in tendrils, white and thick. The movement was orderly, and the smoke was odorless. Vivian got up and ran for the phone. She had to call the fire department. The three women climbed on their chairs. “Your conventional friends can’t help, Vivian,” Clotho said. “We need you to do something,” Lachesis said. “There is no fire.” Atropos peered at the floor. The tendrils of smoke were feeling their way over the couch, around the end tables. Once, it seemed like the tendrils stopped and sniffed the air. “You must imagine this building encased in glass,” Clotho said, her voice breathless. Vivian started to dial 911. “Imagine it and projected it outward, as if you were pushing the image out of you,” Atropos said. Her voice went up as the tendrils got closer. Vivian’s floor was lost in a sea of white. Throughout the sea, white telescope-like things poked out of the smoke and sniffed. Fingers felt the surfaces. This didn’t look like any smoke that Vivian had ever seen before. “If it doesn’t work, then dial your friends,” Atropos said. The other three glared at her as if she had just given bad advice. The smoke curled around Vivian’s legs. It was cool, not hot, and she thought she felt tiny pinpricks against her skin. “Imagine a glass case?” she asked. “Around the entire building,” Clotho said. “Then push it away from you,” Atropos added. Vivian closed her eyes. It took her a moment to envision the building—she’d never really looked at all of it, just the interior—and then she imagined slamming a glass box over it. She pushed the image away from her mind, and actually felt something leave her with the force of a sneeze. She staggered, caught herself on the telephone table, then opened her eyes. “You did it!” Clotho shouted. “I wasn’t sure it would be possible,” Lachesis said, sinking down into her chair. “We’re saved,” Atropos said, reaching for a truffle. “For the moment,” Clotho said. 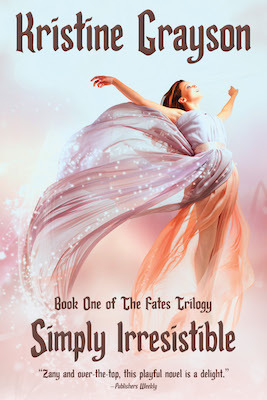 Simply Irresistible is available in ebook and trade paperback here, or as a part of The Fates Trilogy.